I have been reading and listening to Will Richardson for many years. I have a copy of his 2006 edition Blogs, Wikis, and Podcasts which shaped my use of these tools. I was lucky enough to meet Will when he spoke at our school a few years ago. I consider him to be a first level mentor. He has been at the idea of rethinking education for a long time. He is now working with Bruce Dixon at Modern Learners where they do a podcast. I loved this episode as it resonated with me. Will coined the term “change in a vacuum” to highlight how schools work at small projects hoping to influence change and impact the culture of the school. 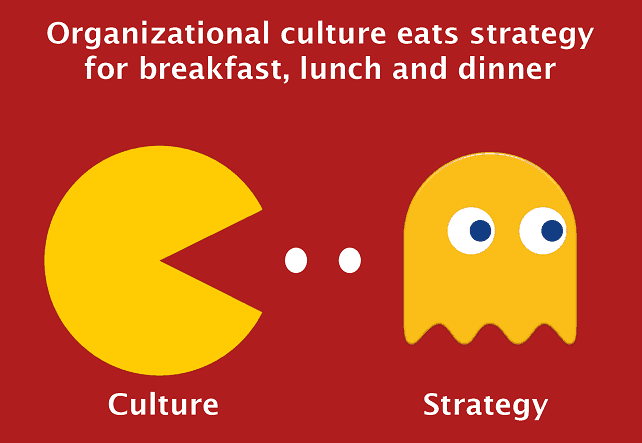 As the image shows, the best laid strategy is eaten by culture every day. I know this to be true as I have helped feed it over the years. Granted, some of my lone nut ideas deserved to be eaten as they were poorly thought out or just nuts. Many of my ideas, like portfolios, blogging, collaborative and creative projects, teaching kids to learn how to use their voice and their face, etc .. were just too far out of the norms of the school’s culture. This is not a judgement about the school’s culture, as I am part of the very culture. I am eternally grateful that I get to try out many of my ideas over the years. The podcast Will and Bruce did on Culture of Change #24 resonated with me especially the term that Will threw out. Will and Bruce discuss the article on Fast Company about how Satya Nadella’s was able to bring change to Microsoft. This is a great quote from the Fast Company article: “He has inspired the company’s 124,000 employees to embrace what he calls “learn-it-all” curiosity (as opposed to what he describes as Microsoft’s historical know-it-all bent) that in turn has inspired developers and customers—and investors—to engage with the company in new, more modern ways”. It is well worth a listen and in fact, I suggest you subscribe wherever you get your podcasts. If you do not subscribe to podcasts, why not?